"I was aggressive but I played the game because I loved and enjoyed it. I might have hurt people and I got hurt myself a few times, but not with any malice. When I went on to the field I just wanted to play football. I didn't go out to kick anybody purposely. I just enjoyed playing and if that's aggression, then I'm guilty of that." 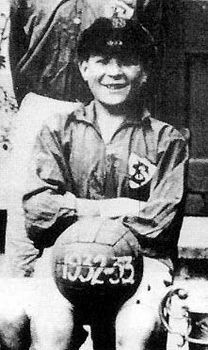 Bob Paisley's precocious talents as a schoolboy footballer were well noted in the County Durham area. His performances as a fifteen year old for Hetton Juniors had attracted scouts from further afield too. Unfortunately for Bob his childhood dream of playing for Sunderland was crushed as he was deemed by the club to be too small. He suffered rejection for the same reason too at the hands of Wolves and Spurs and it seemed his footballing ambitions were not to be realised. Bishop Auckland were to come to Bob's rescue as they signed him up prior to the start of the 1937-38 season and he was paid the princely sum of three shillings and sixpence per match (17.5 p in today's currency). The Bishops were one of England's premier non-league clubs and ferried their players to matches in private luxury cars. Quite a stir was caused on matchdays in Hetton as Bob was invariably picked up by a hired Rolls-Royce. "My big break came when the kings of amateur football, Bishop Auckland, signed me. I had two wonderful seasons with them, climaxed by winning the Amateur cup at Roker Park when we beat Willington 3-0 after extra-time. It was a great experience for an eighteen-year-old." 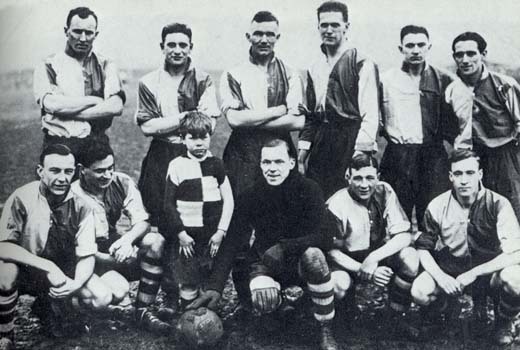 In the incredible treble winning season of 1938-39 Bishop Auckland collected their tenth amateur championship, a non-league record, and Sunderland's interest in signing Bob was reignited. However Liverpool were now on the scene, and unbeknown to Sunderland Bob had promised Liverpool manager George Kay that at the end of the season he would sign for them. Before Bob could sign forms for the Reds though, he had to play his part in an incredible run in to the season that saw Bishop Auckland play eleven matches in fourteen days. There was still one more cup final for the Bishops to play out and on May 6th 1939, they beat South Shields, again at Roker Park, to take the Durham Challenge Cup and thus complete their treble. Just two days later, on May 8th, Bob Paisley boarded a train to Exchange Street station in Liverpool to begin an association that was to last over half a century. Bob duly signed for Liverpool for a £25 signing on fee plus £8 a week in season and £6 a week during the summer: "I was full of beans that day, but it was very quiet really. I was met at the station and after that long trek up Scotland Road in a tramcar, I found there were only one or two youngsters at the ground - Billy Liddell, Eddie Spicer and Ray Lambert. The rest had been recruited for the territorials." After a hard summer's pre-season he had managed just two reserve games at the start of the 1939-40 season when world war broke out and changed everything for everyone. There had still been time for Paisley to be particularly impressed with Liverpool's club captain in those early pre-war days at Anfield. Matt Busby had offered plenty of advice and encouragement to the young Mackem: "He was a man you could look up to and respect. He'd played the game and people like him weren't solely tied down with tactics, which was a valuable lesson for me." Before being posted abroad in the war in 1941 Paisley made thirty four appearances scoring ten goals and resumed his Liverpool career in 1945-46 as the Football League set up a temporary North and South Division prior to the resumption of normalities in season 46-47. On August 31st 1946, in a team that boasted Jackie Balmer, and the great Billy Liddell, Liverpool finally kicked off the new post war era. Paisley missed the opening two matches but made his full league debut in the third game of the season against Chelsea at Anfield on September 7th. In a dramatic afternoon in front of 54,000 spectators, Paisley helped Liverpool to an incredible 7-4 victory, with Liddell, Willie Fagan and Bill Jones scoring two apiece and Balmer claiming the other. If that wasn't dramatic enough a start for the man from Durham, more was to follow. 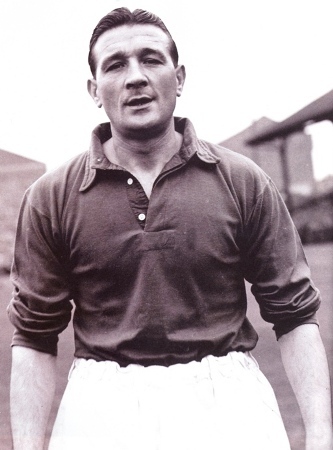 Four days after the Chelsea goal feast the Reds crashed 5-0 to Matt Busby's Manchester United and manager Kay promply went out and signed 28 year old Albert Stubbins from Newcastle United for a club record £12,000. The signing of Stubbins proved a master stroke after he scored on his debut against Bolton and immediately won the fans over. The goals continued and Liverpool marched, eventually, to the title. The winter of 1946-47 was so severe that a huge backlog of fixtures ensured that the season ran on long into summer. Liverpool's last match, a 2-0 victory over Wolves at Molyneux, took place on May 31st and they then had to wait an interminable two weeks for Stoke City, the only team who could overhaul them, to play their last remaining fixture against Sheffield United at United's Bramall Lane. Stoke lost 2-1 and the first title of the new era came to Liverpool. Paisley played 33 of Liverpool's 42 league matches that season and quickly established himself at left-half as a mainstay of the side. He had gained the admiration of others in the squad too through his hard work and tenacity and his ability to correctly analyse the games' turning points in the dressing room afterwards. Tellingly, Paisley himself was becoming aware of the tactical nouse of manager George Kay, who had refused to rigidly tie the players down to any particular formation. Paisley was full of praise for manager George Kay: "He took Liverpool through the War to come out a bit like West Ham did after the First War. He was one of the people who laid the ground for the way Liverpool teams would play in the future... keeping the ball on the ground and passing it well, but being strong on the ball as well."